Today's guest post is from Lauren of My Life as a Plate. Hi! I am Lauren from My Life As A Plate, I am so honored to be guest posting for Kate today, her blog is one of the first blogs I started following. 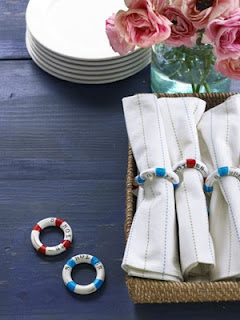 I also love all things nautical and her blog is responsible for many of my nautical purchases. I am a huge fan of DIY projects and decorating my home for all holidays and seasons. From October to April our home is decorated for each and every holiday. Once June arrives I get antsy to decorate the house for the summer. 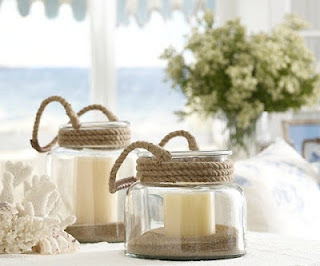 I love to add a nautical look to the home, especially living away from the water it reminds me of being at the beach ( and trying to forget that it is seven hours away). 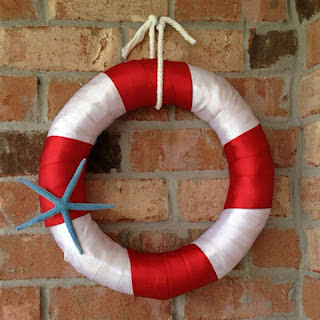 Lately I have found so many great DIY Nautical Projects on Pinterest. 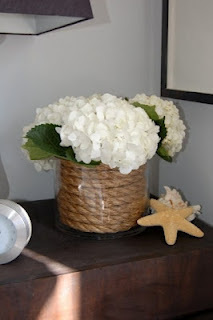 I cannot wait to get started on adding some nautical touches to my home for summer! 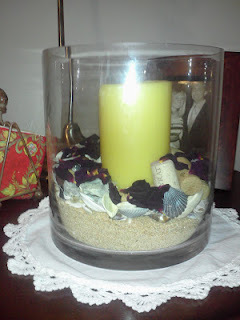 I just added sand, shells, flower petals, and corks. I cannot wait to get started on my other Nautical DIY projects! Thanks again Kate, for letting me guest post! LOVE it! i am beyond obsessed with anything nautical theme - you should check out my blog post today its nautical! These would be so cute in a cottage or summer home.